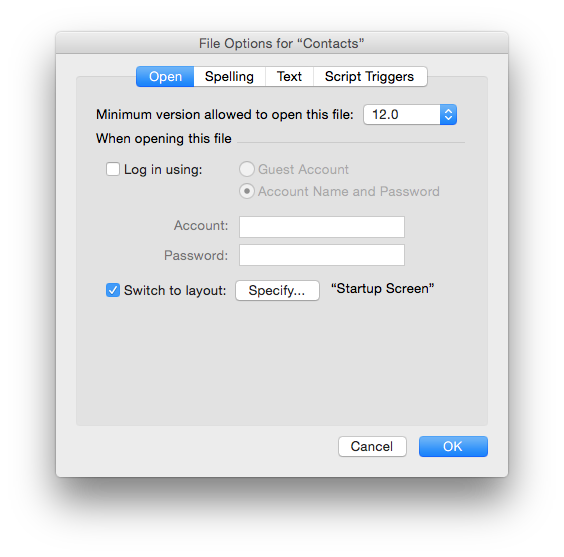 I'm working on an GUI scripting AppleScript that will, for the open FileMaker Pro Advanced document, go to the File menu and select the File Options dialog box, then set some checkbox/radio button and field values. I've got it opening the dialog box but I'm not able to get past setting the checkbox - this is my first time with GUI scripting. I'm using OS X Yosemite 10.10.3. You can't use window 1 without telling what process window 1 is in. You'll have to specify app_name as a parameter now. Not the answer you're looking for? Browse other questions tagged macos applescript script . How do I use AppleScript GUI scripting to change the mouse speed?